"In 1990, Kaban published the first comprehensive book on Pediatric Oral and Maxillofacial Surgery. While 14 years passed, a multitude of new surgical techniques and treatment modalities used in the care of pediatric patients had been introduced. In this latest 470-page edition, Drs. Kaban and Troulis have sought to produce the definitive book on Pediatric Oral and Maxillofacial Surgery. The book is divided into three major sections: General Care of the Pediatric Surgical Patient; Oral Surgical Procedures; and Pediatric Maxillofacial Surgery. In addition to these topics, there are two chapters covering congenital and acquired abnormalities of the Temporomandibular Joint. During training, we all have learned of "gold standard" textbooks to obtain. This is the "gold standard" for pediatric oral and maxillofacial surgery. It should be required reading for every oral and maxillofacial surgeon resident. For the practicing oral and maxillofacial surgeon, it is the reference book to have available when treating the pediatric patient. 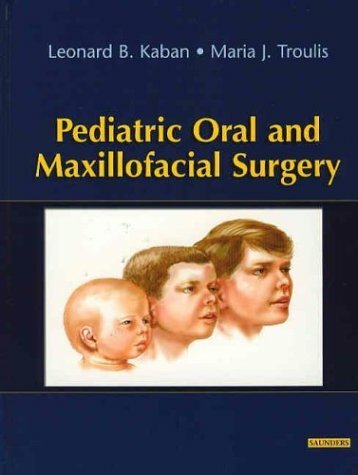 Specialists such as otolaryngolists and plastic surgeons will find the book useful, especially the topics addressed in the pediatric maxillofacial surgery section. In summary, this is a valuable contribution to the literature and should be in everyone's medical library." As the only book available on the topic, this text provides a unique look at both traditional techniques and cutting-edge information on the specific management of pediatric oral and maxillofacial surgery. Vivid photographs from all stages of the surgical procedures highlight the discussions and explanations from the premier authorities in the field. Coverage encompasses all areas of treating pediatric patients, including growth and development, psychological management, anesthesia and sedation, metabolic management, genetics, and speech problems.